WestBeach Condos is a new mid-rise 6-storey mixed-use building with a total of 100 residential luxury suites and retail on the main floor that is located at 1630 Queen St E, Toronto, ON M4L 1G3. This boutique tower is being developed by Marlin Spring Developments where the legacy lives on and their mission is to create landmark urban condominium communities characterized by outstanding location, design and amenities. The site is located on the north side of Queen Street East, east of Coxwell Avenue. 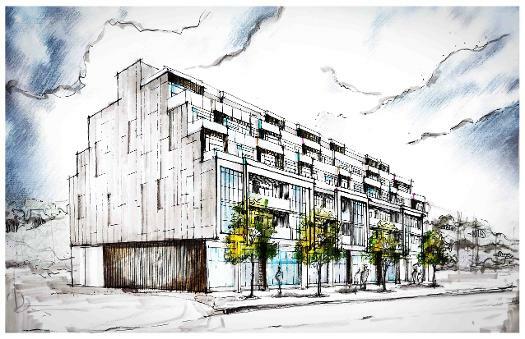 Welcome to WestBeach a new mid-rise project currently in pre-construction at 1624-1630 Queen Street East in Toronto and is designed by ICON Architects Inc. A magnificent mid-rise building in the heart of The Beach Triangle, welcome to beach living at this mid-rise tower. It offers contemporary urban suite designs, a brilliant array of indoor amenities like Fitnesss Centre, Party Room, Entertainment Room, Pet Wash Station and Guest Suite. An outdoor lifestyle amenities like Rooftop Terrace with BBQ Pits, Cabanas and Seating Lounge Area and potential for exciting retail opportunities with prime street frontage. WestBeach is designed for elegant living with an inspired array of interior design and finishes. Every suite offers a brilliant fusion of style and substance with bright and airy interiors with magnificent and breath taken Skyline and Lake Views. On floor levels 2 and 3 you will find 8’6 foot ceilings and 4, 5 & 6 have Up to 9” smooth finish ceilings. Gourmet kitchens shine with gleaming Granite or Quartz countertops, contemporary cabinetry, ceramic tile backsplash and stainless steel appliance package. Bathrooms will be designed with marble or Caesarstone counters, acrylic tubs and modern vanities. Its located just to the east of Coxwell Avenue on Queen Street East located in the Upper Beaches neighbourhood of Toronto. Currently on the proposed site right now is a KFC restaurant which will be replaced with this mid-rise tower. Of the 100 suites, 60 will be one-bedroom and one-bedroom plus den units, 20 suites will be two-bedroom units and 20 units will be two-bedroom plus den units. There will be two levels of proposed underground parking with 59 parking spaces. The main elegant entrance into the grand lobby is from Queen Street East and total residential gross floor area is 4,683.6 square metres. WestBeach is located close to many parks such as Orchard Park, Jonathan Ashbridge Park, Woodbine Park, and Ashbridges Bay Park which is "located in a beautiful area on the waterfront in the east end of Toronto" and where you can see yearly firework displays. It is situated west of Woodbine Avenue and north of Lake Shore Boulevard East. 1630 Queen Street is located a short drive away from Woodbine Beach where you can access to the Martin Goodman Trail and the Boardwalk for your enjoyment as well as the Ashbridge's Bay Yacht Club. It is also located near accessible public transportation and to numerous restaurants along Queen Street East within the community. Its located within the "Woodbine entertainment district and very close to prime retail locations" effortlessly connects you to a host of neighbourhood amenities in every direction and also "offers direct views to Woodbine Park, Lake Ontario and the beach". The project is located within The Beaches neighborhood and along Queen Street East, a minor arterial road that stretches from Victoria Park Avenue in the east to Downtown Toronto in the west. A neighborhood rich in history, the Beach was once separated from the City of Toronto by Ashbridges Bay. This allowed it to originally develop as a vibrant lakeside resort town with public attractions located along its various beaches fronting Lake Ontario and development focused along its main street, which is now known as Queen Street East. Housing types typically consisted of low-rise mixed-use buildings along Queen Street East and detached and semi-detached houses within the neighborhood to the north and south. Today, the neighborhood is experiencing growth and revitalization of its main street with more mid-rise buildings of up to 6-stories and containing a mix of uses. Register with us today for more information on this new mid-rise condo project Marlin Spring Developments! WestBeach Condos Floor Plans and Price List will be available soon. Please call or complete the registration form to get all the info and to register now for the Platinum VIP Preview Sales Event. Category: Platinum VIP Client Incentives: Developer and Platinum VIP Broker Incentives, Promotions and Much More. Schools located in The Beaches having some of the highest academic averages in core subjects. They also provide some of the best extra-curricular programs such as art, music, drama and athletics at the elementary and secondary levels. Students are also provided with exceptional teachers and staff who uphold this exemplary education system. Pools, recreation centres, playgrounds, hockey arenas, soccer fields, artist centres and many more public resources are also available for students. There are a total of 9 public schools and 4 Catholic schools available for children and teenagers in The Beaches. The Beaches, known as "The Town Within The City", is a community that creates the feeling of a secure township. The Beaches neighborhood provides distance from the hustle and bustle of Toronto’s downtown core while still being a distinct part of the city. Streetcar lines and several bus routes connect Beaches commuters to Toronto's downtown along with 4 of the cities subway stations (Coxwell, Woodbine, Main Street and Victoria Park). The Beaches may be Located at the edge of the city, but its not hard to get where you want to go, if need be. The Beaches' streets are lined with a beautiful houses. Houses assortment vary from detached to semi-detached, big, small, modern and vintage, creating a blended aesthetic for house hunters. Residential property in this neighborhood is larger than the average size of housing lots in Toronto and can provide enough space for a big or growing family. The Beaches does not disappoint, with more than enough room to park multiple cars, while storing all the family’s stuff. There are 4 separate beaches available to choose for numerous options for family fun and relaxation. By the water one can find beach volleyball courts, bike lanes, an olympic-size swimming pool, boat rentals and a 3km boardwalk. From there, it’s easy to walk down to the famous Queen Street East, where there are quaint shops, restaurants, bars and stores to enjoy. The Beaches is a neighborhood that caters to the family canine. Dogs are allowed in most stores and restaurants in the area. There are also several dog parks and sectioned areas of the beach. Annually, The Beaches hosts several major events and festivals. These include the renowned Beaches Jazz Fest, Rib Fest, Shakespeare in the Park, and other high traffic events that are fun for families. The Beaches is known as being a great place to raise a family with very little crime. Strong community vigilance allows parents to feel comfortable with their children walking to and from school, the corner store, or a friend’s house. With a small town atmosphere, most residents know each other and communicate regularly, creating a feeling a solidarity between community members. Register With Us Today For More Details On The Westbeach Condos Vip Platinum Access!